bonkers.ie was recently accredited for the sixth year in a row by the Commission for Regulation of Utilities (CRU). We’ll discuss what this means, why you can trust the results you see on our website, and why we believe we’ve the best energy price comparison service in Ireland. The Commission for Regulation of Utilities (CRU) is Ireland’s independent energy and water regulator. The CRU has a wide range of functions including consumer protection and the monitoring and auditing of energy price comparison websites like bonkers.ie. Every year the CRU audits bonkers.ie to ensure the information we show is accurate, up-to-date, impartial and meets the standards set out in the CRU’s code of practice. We were the first energy price comparison service in Ireland to be awarded accreditation by the CRU back in March 2012. Our accreditation has been renewed every year since, most recently in September 2018, and we’re proud to display the CRU’s accreditation on our site. Being accredited by the CRU means you can trust the information we show you and that we meet the CRU’s standards. We’re currently in a period of rising energy prices. This summer the main energy providers announced a raft of price increases and a second round of price increases has just begun. And with wholesale gas and electricity prices still rising, energy prices are only going to increase in the near future. Under the CRU’s code of practice, all energy suppliers must give customers four weeks’ notice before they increase their prices. And because most energy contracts last for at least 12 months, it’s important any upcoming price increases are factored into the results you see when you’re looking to switch. After all, you don’t want to sign up to a supplier who might be the cheapest energy provider today, but who is going to raise prices by 5% or 10% next week. When calculating the full-year cost of your energy, our energy price comparison service will look at both today’s energy prices, as well as the future price if a price change has been announced. This means you can be sure that when you sign up to a new supplier with us it’ll be based on the most accurate calculation of your energy costs as possible. Other price comparison sites only look at the price of energy on the actual day you run a comparison, even if they know prices are going to increase. This means you might sign up to a supplier who might be the cheapest for you at today’s price, but might be the most expensive next week, and by that stage it’s too late as you’ve legally bound youself into a 12-month contract. Annoying, right? What happens if a future price change isn't factored into the calculations? 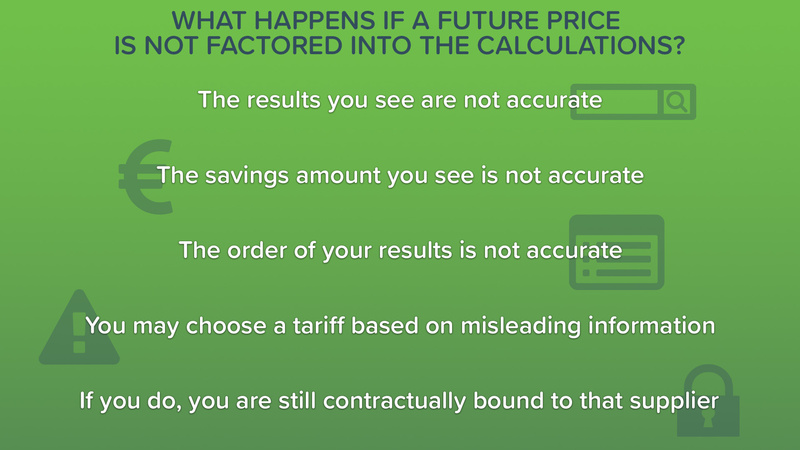 If future price changes aren't factored into the calculations then you won't be presented with the correct results and therefore you can't trust the information you see. At bonkers.ie our approach is to factor everything into your calculations so that you get the most accurate prediction of your future energy costs. This is why we believe we’re the best and most accurate energy price comparison website in Ireland. As Group CEO David Kerr says: “We’re delighted that the CRU has confirmed our accreditation again for 2018. We take this accreditation extremely seriously because it means consumers can be confident that the calculations provided by bonkers.ie have undergone rigorous testing to ensure that they are accurate, meaning customers can trust the results they see. This is important at all times, especially in times when prices have changed so frequently, as they have done in the year since our accreditation was last awarded." At bonkers.ie we know that switching saves. But it’s important you switch based on the right information. We’ve invested heavily in our website to be able to provide our customers with the most accurate results possible, which can factor upcoming price increases (or decreases) into the calculations. And in a time of rising energy prices, this is more important than ever.